The versatile, stylish 2018 Honda HR-V has been wowing critic and buyers alike, Kelly Blue Book selected the HR-V all based on the nearly identical 2017 model. Changes for 2018 are limited but include a vibrant new color, Aegean Blue Metallic, available on select trims. The stylish 2018 Honda HR-V also features a refreshed wheel design with black-painted inserts – available on EX and higher trims – to enhance HR-V's sporty personality. The 2018 Honda HR-V is powered by a responsive all-aluminum 1.8 L SOHC 16-valve four-cylinder engine with i-VTEC camshaft timing, producing 141 horsepower and 127 lb.-ft. of torque. The HR-V is available with Honda's Real Time AWD with Intelligent Control System for outstanding all-weather handling. A continuously-variable transmission with Honda "G-design" shift logic is available on all models, and a six-speed manual transmission is available on LX and EX trims outfitted with 2WD. Not only is the 2018 Honda HR-V stylish and functional, it's also efficient, with EPA fuel economy ratings of 28/34/31 mpg* (city/highway/combined) for CVT-equipped two-wheel drive models and 27/31/29 mpg* for models with all-wheel drive, while 6-speed manual 2WD models received a 25/33/28 mpg* rating. Fully independent front and torsion-beam rear suspension systems with amplitude-reactive dampers maximize rear seating and cargo space while providing outstanding handling characteristics and ride comfort. Electric Power Steering provides a refined and sporty steering feel while all models feature power-assisted four-wheel disc anti-lock brakes, 17-inch aluminum alloy wheels and 215/55R17 all-season tires. The 2018 Honda HR-V will continue to deliver one of the most versatile interiors in the segment thanks to Honda's second-row Magic Seat which can be configured into any one of four different modes for different seating and cargo configurations. 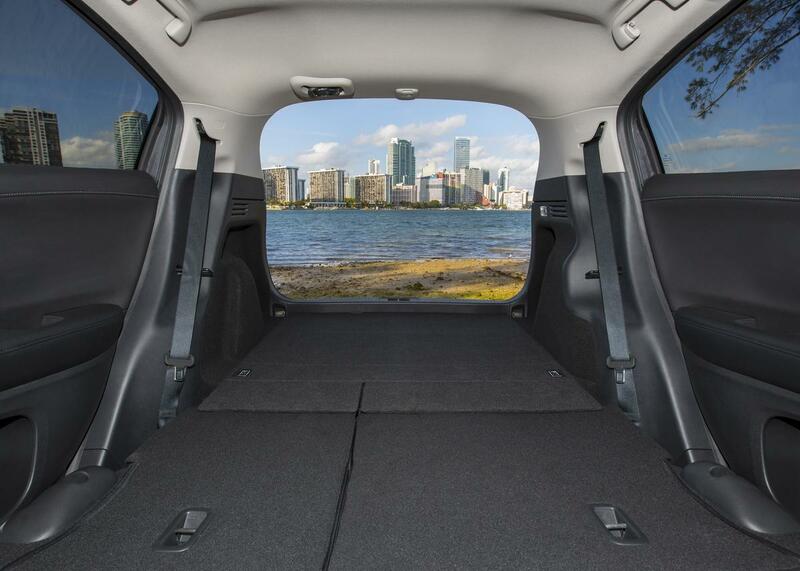 With 100.1 cu.-ft. of passenger space and up to 58.8 cu.-ft. of cargo volume with the second-row seats folded down, the HR-V has as much interior space as some competitors' midsize SUV offerings. The HR-V utilizes a unique center-mounted fuel tank layout that enables the second-row Magic Seat to fold completely flat into the floor, creating a more spacious and versatile interior package. Driving efficiency, handling performance and cabin quietness are further aided by an aerodynamic shape and a lightweight yet rigid body structure with significant noise-insulating materials and design features. Twenty-seven percent of the HR-V structure is composed of advanced ultra-high strength steel for improved rigidity that enhances handling response, provides a quieter cabin, improves ride quality and helps provide substantive passenger collision protection. The HR-V is designed to achieve class-leading safety ratings and features including Honda's next-generation Advanced Compatibility Engineering body structure for enhanced frontal collision protection. Standard safety and driver-assistive features include four-channel anti-lock brakes (ABS) with Brake Assist and Hill Start Assist; Vehicle Stability Assist (VSA) electronic stability control system; a Multi-Angle Rearview Camera; dual-stage, multiple-threshold front airbags; driver and front passenger side airbags; side-curtain airbags for all outboard seating positions; and a Tire Pressure Monitoring System (TPMS). Honda LaneWatch display is included with EX and EX-L Navi trims. In regards to connectivity, even the base LX model offers more features than some of its competitors. The LX come equipped with a five-inch LCD color screen, a 160 watt four-speaker audio system with MP3/Aux jack, USB audio interface, and speed-sensitive volume control. Upper range models add to that with among other features a 180 watt, six speaker audio system with a seven-inch Hi-Res display along with navigation options. Hard to image but there’s even more to the 2018 Honda HR-V than we can cover here, and there’s no way to really appreciate the volume of the interior until you see it for yourself. If you live in Davis, Citrus Heights or Elk Grove areas, the best way to do so is to come into Mel Rapton Honda in Sacramento. Let the experience sales team show you everything the HR-V has to offer before you head out on a test drive. * Based on 2018 EPA mileage ratings; Use for comparison purposes only; Your mileage will vary depending on how you drive and maintain your vehicle, driving conditions, and other factors.